Pharaoh’s Fire is the sequel to Pharaoh’s Way (reviewed here). It is a slot machine game that includes a variety of unlockable slots for you to play. The game is available for both the iOS and Android platforms. Well, Pharaoh’s Fire is similar to the original game. In it players spin the slots to accumulate credits and diamonds to unlock new slot machines. 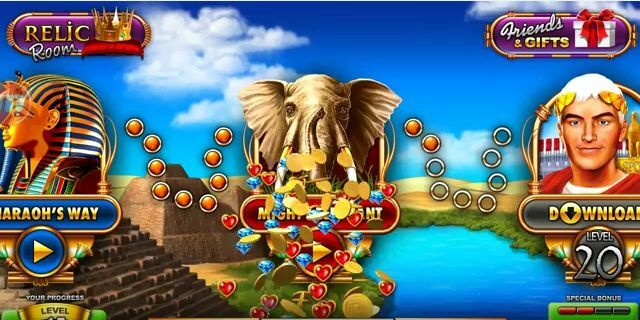 Like the original, you play through 10 levels to unlock a new slot machine; and staking more credits wins more diamonds. It also retains the card mini games with which you can double credits by predicting which card color or suite will be dealt. So what is new in this sequel? 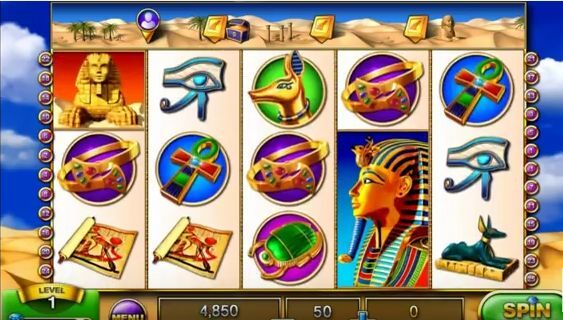 Well, the most notable new addition to Pharaoh’s Fire is the bar at the top of each of the slot machines. The bar includes a slider that gradually scrolls to the right as you play through the levels. It includes relics, or treasures, that players can collect. Collecting all the relic pieces gives you a credit boost. In addition, the bar also includes a random treasure chest games. When the slider moves over a treasure chest, it unlocks further mini games. Thus, the developer has added a greater number of mini-games to the sequel that enhance its variety. Aside from that, Pharaoh’s Fire doesn’t offer many new features aside from alterations to the bonuses. The game still gives you a free credit boost every four hours. In addition, now you can collect a daily return bonus, between 1,260 and 1,688 credits, each day that coincide with current moon phases. It is slightly easier to accumulate credits in the sequel. So that should make it quicker to unlock new slots. Yet, it actually feels just as much a grind as the original in that respect; and took me an average of three to four days to unlock slots. There is not much difference in the graphics between the original and sequel. The developers might have added slightly more 3D graphical effects to Pharaoh’s Fire. Among the more notable are 3D spinning coins that rain down over the slot machines. Some of the bonus games also include 3D dice and rotating wheels. The sequel retains the slick animations and quality art from the first game. The sound is also decent when it is working. However, a number of times it loaded without any sound working, but the audio was fine with my other apps. This was a recurring issue, and I had to delete and reinstall the game a few times to restore the sound. So do not be surprised if you find the game’s audio does not always work. This sequel is just as good, if not a little better, than the original slot game. Pharaoh’s Fire has very decent visuals, and the extra mini games and relics add a little more spice. The game is also freely available on both the Android and iOS platforms.